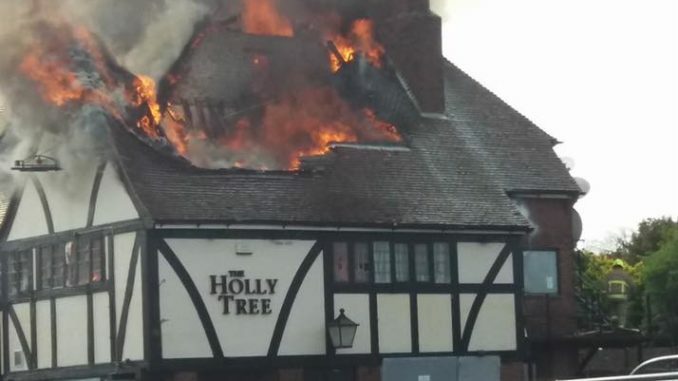 Fire crews are at the scene of a blaze at the old Holly Tree pub in Cliftonville. They were called out at 8.40am today (April 16) to reports of a fire in the roof of the now disused pub off Northdown Road. Four fire appliances and a height vehicle are in attendance and crews are working hard to contain the fire using hose reels and main jets supplied by a hydrant. There are no reported injuries and the cause is not yet known. Roads close to the pub, including Northdown Road, are currently closed while the incident is dealt with. The pub closed last year after a century of serving punters. It had been badly damaged in a blaze in 2014 when the pub kitchen caught fire.